Sherry Fitzgerald O’Meara bring this four-bedroom home in Ardnacrany North, Tang, Athlone, to the market. This is a property that offers so much in choice and potential to prospective new owners. Accessed via a quite cul de sac laneway, the property is a modern four-bedroom detached bungalow style residence with detached garage on an overall holding of circa 4.04ha / 9.9 acres. The house is presented in excellent condition, with bright, neutral decor running through, and mature, well maintained lawns outside. The additional 3.64ha / nine acres consists of a single parcel of excellent quality agricultural land. This is perfect for someone wishing to be a small holder or a person with an equine interest. 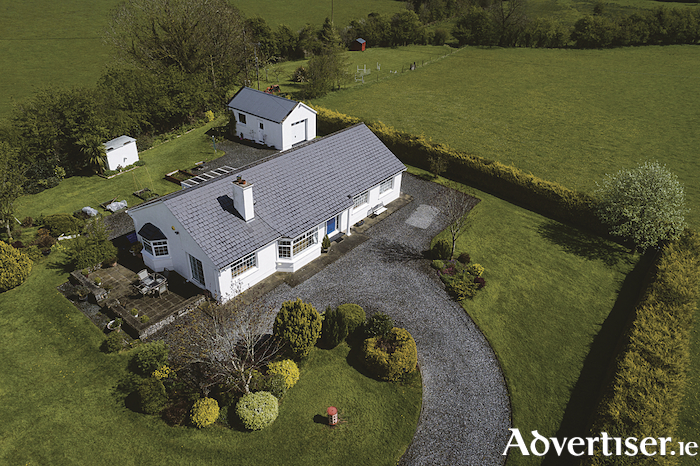 The property is two minute drive from Tang and is just off the N55 Athlone / Ballymahon Road, being 20 minutes from Athlone and five from Ballymahon. The home offers four bedrooms, three reception rooms, two bathrooms, well maintained gardens, central heating and attractive decor. Call agent Ollie Moore on (086 ) 8595186 for more information or to arrange a viewing.